Global Cooling since 2016 – 2018 was the 6th warmest year in the past 40 years | Watts Up With That? The global temperature has fallen over nearly three years, as illustrated by the graph above. Source: Dr. Roy Spencer, UAH. The global average bulk-layer atmospheric temperature fell slightly in December to +0.25°C (+0.45°F) led by an unexpected dip in tropical temperatures. It seems the warm seawater temperatures in the tropical Pacific have cooled a bit. NOAA has indicated that this warm El Niño episode may be a mediocre one and the current modest changes support that view. Global temperatures at this point (December 2015) in the 2015-16 major El Niño were +0.47 °C and rising, eventually hitting +0.86 in February 2016. At the current +0.25 °C, the global temperature is well below that of the last event. The modest nature of the El Niño is more revealing In the tropics where the December satellite temperature values for the last two major El Niños (1997-8, 2015-6) were +0.72 and +0.64 °C respectively. As noted above, this December’s tropical temperature is +0.32 °C. The month’s coldest seasonally-adjusted temperature departure from average was located near Altai in Western Mongolia (-3.7 °C, -6.6 °F) and the warmest near Dome Fuji in East Antarctica (+3.2 °C, +5.8 °F). Hemisphere. The warm spots are roughly in between these, landing in eastern Canada, Western Europe to northwestern Russia and eastern China to Japan. Australia was well above average too. The tropical band has shown a loss of heating with most of the region now near average. 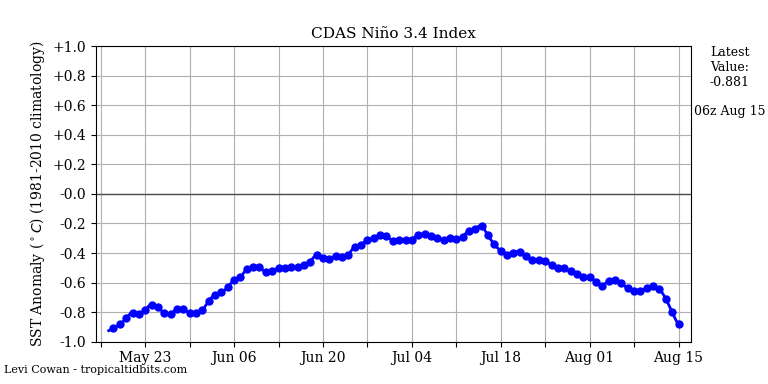 The evidence for an approaching warm phase of El Niño continues according to NOAA, as the equatorial Pacific sea temperatures, both surface and deeper down, are still well above average, though have declined a bit since late November. A good portion of this extra heat should make its way to the atmosphere in the coming months. If this occurs, we should see considerable tropical warming in the atmospheric layer the satellites monitor. Because this is December, we will also present diagrams for the entire year. For 2018 as a whole, the Northern Hemisphere’s mid-to-high latitudes were dominated by above average temperatures with the exception being regions in northeastern Canada to the northwestern Atlantic and Kazakhstan. Globally, the year was the 6th warmest of the past 40 calendar years as it was subject to a split personality, beginning with a modest La Niña (cold event) and ending with a modest El Niño (warm event). Ten warmest years of the past 40 for the global lower troposphere. Finally, a map of the 40-year trend (1979-2018) indicates most of the planet experienced a modest warming, overall being +0.13 °C per decade. Faster rates of warming occurred in the high northern latitudes, the conterminous U.S., Eastern Europe to the Black Sea and from China eastward to the North Pacific. In the Southern Hemisphere, a band from Brazil to New Zealand warmed faster than the global average. Patches of little warming or cooling are found in the north Atlantic, eastern subtropical Pacific and portions of Antarctica. (ATMS) carried on Suomi NPP and the new NOAA series JPSS. We are hoping that NOAA19 will be the last spacecraft for which drifting adjustments will be required as the newer satellites (MetOP, NPP, JPSS) have on-board propulsion to keep them in stable orbits. With so many new items to test and then incorporate, we are waiting until we are confident that these adjustments/additions are appropriately stable before moving to the next version. In the meantime, we shall continue to produce v6.0. As part of an ongoing joint project between UAH, NOAA and NASA, Christy and Dr. Roy Spencer, an ESSC principal scientist, use data gathered by advanced microwave sounding units on NOAA, NASA and European satellites to get accurate temperature readings for almost all regions of the Earth. This includes remote desert, ocean and rain forest areas where reliable climate data are not otherwise available. The satellite-based instruments measure the temperature of the atmosphere from the surface up to an altitude of about eight kilometers above sea level. Once the monthly temperature data are collected and processed, they are placed in a “public” computer file for immediate access by atmospheric scientists in the U.S. and abroad. Neither Christy nor Spencer receives any research support or funding from oil, coal or industrial companies or organizations, or from any private or special interest groups. All of their climate research funding comes from federal and state grants or contracts. Updated 12PM PST: Headline added to, plus graph at top of post added, with comparison of Feb 2016 temperature. Graph from Dr. Roy Spencer, UAH. January 3, 2019 in Climate data. ← The NanTroSEIZE Project: Drilling through a plate boundary in an active subduction zone. Good. I love warm. Why do so many seniors move south? They hate cold. You are measuring things. With devices. And making calculations with those measurements. And your margin of error is? An order of magnitude greater than the signal being claimed. Great update for TLT, but unless my feeble aging eyes missed it, I don’t see any indication as to what reference period is the basis for the anomalies. I presume it is 1981-2010, but it should be labeled on all the appropriate graphs and figures so as to leave no doubt (this comment addressed to the original authors). Since these graphics were not generated by WUWT, at least a postscript footnote comment would be helpful for nitpickers like me. Retuning the satellite measurements. Uh-oh !! Those satellites always drift low in recent years and high in distant years, never mind we’re talking about historical data. Thomas Karl NOAA demonstrated that it is just fine to adjust historical data if it supports the globqal warming narrative. So let’s go ahead and restate all of the data… and make sure that the distant years are adjusted cooler and the recent years read hotter like in the Karl et al fidgeting … so to raise the alarm whistles and bells! I think this quote sums it up…Neither Christy nor Spencer receives any research support or funding from oil, coal or industrial companies or organizations, or from any private or special interest groups. All of their climate research funding comes from federal and state grants or contracts. Every single corporation in America seeks government contracts and funding … and their bottom lines would crater without it. I believe this is termed … “corporate welfare”. So why have have I never heard the term … “scientific welfare”? “Global Warming welfare”? “Climate change welfare”? Every single corporation in America seeks government contracts…I believe this is termed … “corporate welfare”. government contracts are *not* corporate welfare. They are business contracts to provide a good or service, really no different than contracts from/with other businesses. The only difference is that the customer is the government rather than another business or other private individual/entity. Agreed. Now please describe the -essential- goods or services delivered by the climate change welfare recipients? They provide jobs for relatives of politicians. Oh … and what private business gives out contracts for goods or services at the volume and size as the US government? With virtually no cap on cost overruns, let alone any penalties for failure to deliver said goods and services. Yes, the taxpayers pockets are deepest. There is NO comparison with … any other typical business. Please do not refer to ‘tax breaks’ as government welfare (or some kind of a subsidy). A tax break is when the government takes less ‘private money’ than they threatened to take. A subsidy or welfare is when the government doles out money to some people that it has taken from other people. There is a fundamental and important difference. People in a ‘free’ society are raised to believe that they can make their life whatever they want it to be; that the can achieve great things and reap the benefits of private wealth and success. People in a more socialist society are raised to believe that all material wealth belongs to the government and all material benefits are bestowed by the good graces of the central authority. When we equate tax breaks with welfare, we are buying into the language of the New Socialist World Order, and they win another small victory! I was quoting a definition copied from online. Just google “corporate welfare” and you’ll find that very definition and/or others just like it. Don’t confuse “corporate welfare” with “subsidy” the two are not the same thing (while the later is one form of the former, not all of the former is the later). while a tax break is not, strictly speaking, a subsidy (as you say, and I agree, it is taking less of other peoples money, it is not giving them money that they did not first earn) it can be “special favorable treatment” if it’s a narrowly targeted tax break designed specifically for the benefit of particular corporate interests. Tax breaks on EVs for example are designed to benefit EV companies over their non-EV competition (Ie incentivize people to buy EVs instead of traditional ICE vehicles) and are very much “corporate welfare” even though they aren’t strictly speaking a “subsidy”. or, for another example where tax breaks are a form of corporate welfare: Amazon – Amazon stands to get nearly $2.5 billion in tax breaks and other incentives as part of its deals to open up two new offices. Many of those tax breaks and other incentives are specifically for Amazon’s benefit to lure them to picking those locations for their new HQ. My understanding was that was exactly what Eisenhower did know. Fact is that almost everybody has a paymaster somewhere. Spencer and Christy are somewhat unusual in that their results often conflict with what is wanted by their political paymasters and associated cronies. But Spencer and Christy don’t bend their scientific ethics like a green reed in the breeze. Seems to me that the warmest spots are always the areas with the least number of temperature sensors. This is a satellite view. What you mean I would understand if the head post was talking about e.g. radiosondes. But here, satellites are measuring 60 GHz emissions by O2 molecules, and I hope you will agree upon their rather uniform repartition within the lower troposphere. I hope my old bones and body lasts long enough to experience a 0.5C warming from here. Never mind, I’ll just take a hot bath. My thoughts are the same as yours. The second we hit the mythical 1.5C warming, and nothing disastrous happens to the planet, does that mean the end of the IPCC? In which case we can say “told you so”. I sure hope so and the sooner we get there the better as far as I’m concerned. The alternative is that the planet is plunged into global cooling and despite we sceptics not wanting it we can always say “told you so” then as well. Clearly, you just don’t understand (:-)). When (if) we have reached the 1.5C increase over the pre-industrial era, there won’t be sudden catastrophes. I wish everyone understood that. The 1.5C increase is a pre-condition. We will, however, have “baked-in” the conditions leading to catastrophes 50, 100 or 200 years from now, when no one will be around to be held responsible for their irresponsible projections. There is a fair amount of sarcasm in my comment, as well as some truth. Or, high probability it will cool down despite mor CO2. The nul hypothesis is being staved off with as much trickery as can be decently put over on people. Even if more CO2, all other factors remaining the same, caused higher temperatures, there interacting homeostasis effects that counteract the temperature rise. Also, natural variability has resulted in 30-40 year cooling effects with rising CO2, and the warming periods have been exaggerated by natural rising trends. This all means that CO2’s effect is much less than the zealous have calculated. It is why IPCC and core crisis warming proponents forecasts 30yrs ago are running ~300% to warm, and why they started calling them ‘projections’ sonehow thing this validates them more. Here is my bet, business as usual, we wont even reach as high as the Paris target. The second we hit 1.5C the alarmists will have a field day with catastrophic events, however imagined. It goes up and it goes down, but it goes down too slow to cool policy mistakes by alarmists and policy fraudsters emanating from the the warm anomaly regions. There is not enough to go around. Sorry. But you can send your carbon tax money to California and Paris for the virtue signaling cause. So the 6th warmest in the last 40 years means its not even in the top 10%. No doubt we will still see low IQ types claiming to be scientists still claiming this is evidence of global warming. Evidence of global warming is the trend since 1979. Circumstantial evidence is the fact that 4 of the 6 warmest years have occurred in the most recent 4 years. Ah, but if the warmest year on ‘record’ was 1998, and 2018 was the 6th warmest doesn’t that indicate another trend? It ain’t getting any hotter buddy. Take out the El Ninos and the customary statistical ‘margin of error’ origami and hocus pocus with data sets and bugger all’s being happening for 20+ years. And that’s in spite of the huge increase in Co2 emissions over the same period and the burgeoning UHI effect of human population growth and activity. Makes you wonder about all this settled sciencey stuff doesn’t it? God forbid that there might be some natural explanation going on in the background that 97% of the world’s leading sciencey type guys and gals might have missed to explain the complete failure of Mother Nature to stick to the doomster script. P.S. 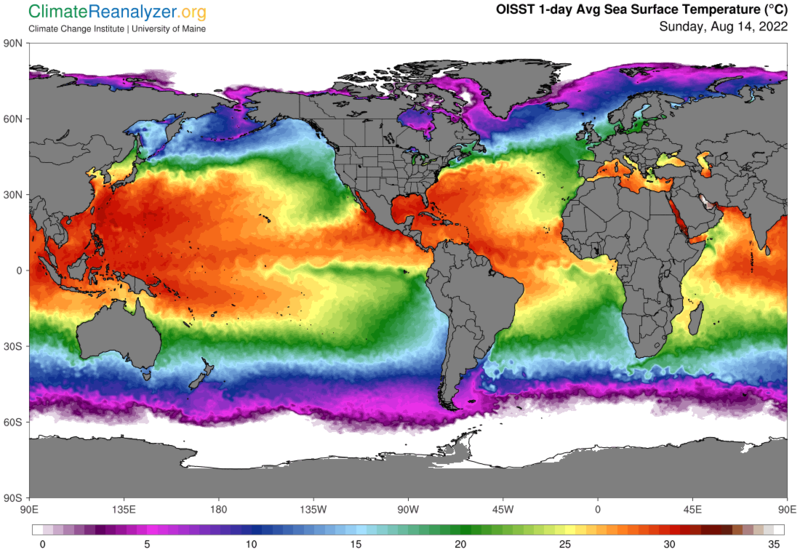 For anyone who missed the recent tipping points, when all our coastal cities and holiday beach resorts were drowned under a tidal wave of carbon sins as predicted by ‘The GoreMeister’ and his fellow investors, you’ll be pleased to know that a melting glacier will obliterate you all next week. Or in 2030. Oops, I meant 2070, ish! Keep smiling folks, and make the most of what this rather benign period of climate history is doing for mankind. It’s probably as good as it’s going to get for the current generation. 2016 was warmer than 1998. But whatever, the point is that individual years don’t really matter. What suggests there is a warming trend are the increasing frequency of warm years. But what confirms there is a warming trend is actually calculating the trend. Have more warm years during the +AMO is expected. It’s called science. Try it sometime. usually folks include an uncertainty associated with the claim of what order the years are in. Of course the recent years are the warmest. It has been getting warmer for the last 200 years or so. Sometimes people blogging at WUWT forget some basics that are fairly well established by data, resulting in quibbling over non-issues. I believe it is fairly well accepted, except by CAGW fanatics, that there was a Medieval Warm Period (when Greenland was green, if you will) and also a Little Ice Age (when the Thames froze over in the winter and sunspots were missing.). 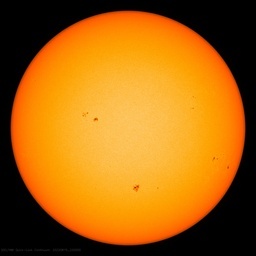 And accepted that now we are in a multi century rise from the Little Ice age, perhaps with other cycles superimposed related to sunspots or ocean cycles. If we are in a period of naturally rising temps, of course the most recent years are the warmest….in the last 30 years, 40 years, 100 years, take your pick. It is a trivial projection of the past rising trend, and means nothing for the CO2-driven CAGW argument. Just the opposite, however, if temps flatten. If a flat trend continues, then a new climate regime could be starting…a return to another little ice age, for example. So a pause is proof that the admittedly rising CO2 is not driving up the climate, unless some equal and opposite events are going on….with a cooling process countering a warming process. The principle of Occam’s Razor says don’t go there without exceptional evidence….which does not exist. CAGW is now a political and quasi-religious issue. The science (meaning data-based, not computer-algorithm-based thinking) that exists does not support CAGW. Sats sre wrong. Sun is destroying whatever they use to measure. Click on my name to read my report. Needs an update for 2010 rate IMO. The climate is so boring thousands of climate warriors may face junket extinction! It is truly worse than we expected. We are on the brink of the tipping point of mildness, that endangers all of our access to OPM. I see a sine wave in that graph. We are on the backside of the red crest, heading for a traversal of the X axis. Prove I’m wrong. Man, now that is science. The peak of the AMO is warmer than the other parts of the AMO. Who wudda thunk it?? The four warmest years on record are el nino years. But far more damning is the fact since 2002 the temp increase is miniscule (0.05 at best) but CO2 went up 14 %. Always follow the data. If you actually work out the numbers, the trend since Jan 2002 was 1.2 °C/century, little different to the trend since 1979. And the trend difference since 2002 was 0.2°C. And little different to the trend from 1879. So where is the CO2 warming? It is supposed to be accelerating, not trending the same as it was before all the “carbon pollution”! This is satellite data for the lower troposphere. There is no trend since 1879. Of course there is a trend since 1879 – you just don’t know what it is. Similarly, you don’t know all there is to know about how Earth’s temperatures change. Your statement might be accurate, but it is based on the wrong science. In the last 40 years there were about 10 so Enso events, with the slightly positive trend, but only the warming part of the AMO cycle. The true trend may be known only after another 15-20 years of data. so nick, we are only going to analyze the last 40 years, since satellites started keeping records? what about the rest of time? you are right, since 1979 the trend is about 1.2c per century. that doesn’t sound really bad at all when you consider the extra warmth and co2 is resulting in planet greening and crop yields up and none of the bad predictions. kinda cherry picking, 40 years out of 4 billion or even the last million years to try and make some bold, end of the world, mankind is going to kill the planet. if we are cherry picking, lets use the 1940’s to 1980, another 40 year cycle. co2 went up, temperature went down, ice increased. bottom line. 40 years is nothing in the cycle of this planet. it warms it cools, over and over again. sometimes lots warmer and sometimes (12000 years ago) it was really cold. if you want to believe that co2, going from 300 ppm to 400 ppm is the magic sauce that will tip the balance, go ahead. if one wants to believe that its all about co2 and ignore the sun, orbits, ocean heat movement and currents, that’s ok too. I don’t see enough data to justify my electric rates jumping from $0.10/kwh to $.20 or $.30/kwh and completely stopping all fossil fuel use and modern chemistry and medicine…..to save the planet. Didn’t you recently claim that 2018 was going to be the 4th warmest year? What happened to your prediction? Operative word being “surface”. All surface data sets look to place 208 as 4th warmest, both satellite sets as 6th warmest. The difference is down to the two El Niño years of 1998 and 2010 being a lot warmer in the satellite data than in the surface data. Nick, the trend this century is zero when you remove the influence of ENSO. So, the question is why are you not pointing that out? I think it is – “Follow the money”! ‘Shocking’ – and so forth, applied to perfectly ordinary meteorological phenomena. The Met Office, here in Britainistan, is looking forward to start the naming of (hitherto) ordinary rainy days. [We do get a few of those here, you know!]. So – Caveat emptor, and ‘Follow the Money’. 2017 is the third warmest year and it’s listed as a weak La Niña year. Bellman, not every year starts at the same baseline. Due to the absence of any Bjerknes feedback there was a lot of warm water hanging around after the 2014-16 El Nino. The 2017 La Nina was very weak but appears to have brought us back to the baseline we’ve been near this entire century. This shows up best in the Spring/Summer data. SC24 is entering what might be a prolong minimum with possible a late start of the SC25 too. Not even a ‘dead cat bounce’ . The Sun was very close to the Earth three days back [apogee and perigee]. It occurs twice in a year. There is a real sense of urgency (Dems) to lock in carbon tax revenues before this gets any more obvious to the masses that the anomaly is going away. The whole enterprise is at risk here. Oh, no, the world has cooled by 0.6 degrees C in just 2 years. We are doomed! Weren’t we just told that a further 0.5 degrees of warming must be avoided to prevent catastrophes? Average global temperature is a scientific nonsense. You should have provided the average.. Ie. 0.4C?? Ha. Interesting, that. Over a range of 187.1 C.
It is interesting that maximum and minimum recording temperatures are equidistant from the water’s freezing point. This would suggest that this stage of the our planets evolution, the ice age is the Earth’s natural equilibrium, while the short inter-glacials, as the current holocene are exceptions. Note the commencing date, 1970. I recall that being a cold period, “The ice age is coming”. What about going back to 1880. That was said to be about the end of the “Little ice Age” and we did not have all that much heavy industry back then compared to today. But it was still very cold right up till 1911, remember the Titanic sinking. Also lets not forget the 1930 tees, it was hot, so by those periods what is a .5 C, and why do they make such a big deal of it ? But it suits a lot of politicians to have something to scare us with, then just as long as we vote for them we are promised that all will be well. Come to think of it, that sounds just like a faith that a lot of people still believe in. In other words, we call discussing highest temps in a range of less than ONE DEGREE C a real discussion ? In the time it took me to compose this, I aged 300,000,000,000 nanoseconds — oh God, I’m dyyyyyyyying !! Excellent. And if the graphs of anomalies were also on a representative scale they would be wide enough that they would appear almost a flat line. For the love of God, USE KELVIN!! Looking at the December temperature report from UAH it seems that the 2306/2018 abnormalous El Nino rise is finally on a downslide. Simple extrapolation frpm its presently rported site puts global temperatrure back to thge zeo line on this chart by 2022. YoBack to zero line by 2022. Arno ArrakAnd Anthony – by eraswing what I say makes you afraid pf it. Siberia, Alaska and Canada are warming since the LIA: the horror! I don’t think it is – or it has been – warming in Alaska. that is 0.8 degrees C lower now than it was 18 years ago. Funny. That -0.8, now versus 18 years ago. I had exactly the same result that I measured here [in South Africa], but that was over 40 years. seems the link that I gave does not work. Meanwhile, the temperature in the Central Pacific has dropped. An interesting weather situation in North America. Lows cumulate around Hudson Bay and southern Greenland. We’re roughly back at the 2002-2007 temperature level again. What happens over the this year will be very interesting, and will give us a better indication of whether the 2014-2016 El Niño will be followed by a step warming like the 1997-1998 was. Looks like we could have another little temperature wobble, then a step change as NH winter in December 2020 moves in with a cooler temperature regime. So, global warming is confirmed because 2018 was not the hottest year. I have now read twice that the Satellites Measure from the Surface to the Top of the Atmosphere. So WHERE ARE THE SURFACE TEMPERATURES? Why do we only see Lower Trop average -9C and above even colder. If the satellites can actually measure the surface temperatures why aren’t they published for all the areas where we actually have Thermometers to compare them to? What is happening in the Trop is NOT what is happening at the surface where we live and where it is important. my experience has been that you cannot rely on the sats because of issues with the degradation of the measuring instruments [when exposed to no atmosphere] and the uncertainty in the exact position of the satellite above earth. Anyway, they all still seem to believe that earth is still warming when in actual fact the opposite has happenend and this is in fact the reason for many of observed climate change. Click on my name to read the way I approached the problem. and do something similar IYOB to see whether the place where you live is actually warming or cooling? Given the strong sub-decadal variability seen throughout the UAH monthly data series, the decline from the record 2016 peak hardly constitutes any noteworthy “global cooling.” Much more noteworthy is the uninterrupted run of positive anomalies from early 2012 onward–by far the longest in the satellite era. It would require a similarly long run of negative anomalies to speak meaningfully of global cooling in any secular sense. Meanwhile, the current anomalies seem disinclined even to register values below ~0.25 C. That’s definitely still in the warm phase of any multidecadal oscillations. This only indicates the disturbance of the ENSO cycle, which causes the strongest fluctuations in global temperature. Yes it is in the warm phase, thank goodness, but that period is not that unusual. The period from 2012 to the 2016 el nino running average rises by 0.5C with a plateau at 2013. But you have to remember that it is measuring the heat leaving the earth via the atmosphere. Current circulation (polar vortex) in the central stratosphere. It’s warmer in the day than at night because of the Sun. It’s warmer in summer than in winter, because of the Sun. All else is imagined, no more than superstition. As vast, organised, convinced and corrupt as the Catholic Church an army of the confused study the roons finding themselves ever more confused (but wonderfully rewarded for writing perverse scriptures). Even wuwt is drawn in, quoting those scriptures, debating the sermons of the priests. The Sun is waning, heretics warn of the coming cold. Best to listen. thx. I used some of your argument in my latest post.